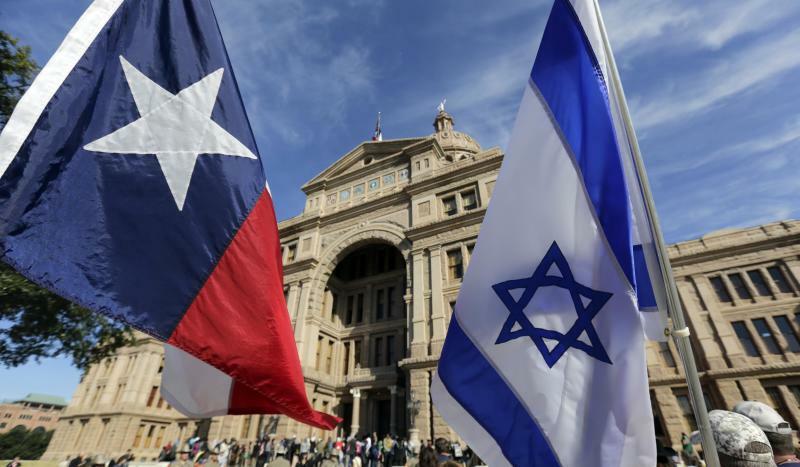 A newly elected Texas state lawmaker is under fire for a divisive Facebook post asking Muslim visitors attending an event at the state capitol in Austin to pledge allegiance to the United States. The event, Texas Muslim Capitol Day, was organized by the Texas chapter of the Council on American-Islamic Relations. "Today is Texas Muslim Capital [sic] Day in Austin," Molly White, a House Republican, wrote on her Facebook page Thursday. "The House is in recess until Monday. Most Members including myself are back in District. I did leave an Israeli flag on the reception desk in my office with instructions to staff to ask representatives from the Muslim community to renounce Islamic terrorist groups and publicly announce allegiance to America and our laws. We will see how long they stay in my office." The post followed a similar Facebook message that was posted along with a report from the "Right Wing News" website about a Dallas community creating a voluntary sharia court to dispense Islamic justice. "Remember, in the Koran, it is ok to lie for the purpose of advancing Islam," she wrote. "Texans must never allow fringe groups of people to come here so that they can advance their own culture instead of becoming an American and assimilating into the American way of life. That, I can assure is not the intent of most Muslims who move to America." The posts drew immediate criticism from many Facebook users. "You can't seriously be this clueless," Fatima Ahmed wrote. "Not very 'Christian' of you. We should organize a group to come visit you and shower you with love in return for your hate. That's would Jesus (Peace Be Upon Him) would do. But what would you know about that. #Islamophobia #Bigotry #MollyWhite #TAKEONHATE." "Just like the extremist groups hiding under the Muslim label, it looks like we've got an extremist here hiding under the label of Christianity," Kelly Pfeiffer wrote. "Next can you ask all white people visiting the capitol [to] denounce the KKK?" Laura Wright asked. "When you do, please ask your staff to make a youtube video! I’d watch it!" "I came here to call you a bigot, but I see everyone else beat me to it," John Glover wrote. "This is a gross misuse of a political office," James Propes wrote. But White, a 56-year-old anti-abortion conservative from Belton, Texas, dismissed the criticism. "I do not apologize for my comments above," she wrote. "If you love America, obey our laws and condemn Islamic terrorism then I embrace you as a fellow American. If not, then I do not." White did not immediately respond to a request seeking further comment. In response, CAIR sent a letter to Texas House speaker Joe Straus asking if White had violated any House rules in discriminating "against certain religious minorities trying to meet with her or her staff." "Are House members prohibited from making constituents take oaths before meeting with their elected representatives or house staff?" the letter asked. White's comments come after the deadly terror attacks in France carried out by Muslim extremists earlier this month. Thursday's event drew several dozen protesters, who gathered outside the Texas state capitol holding signs ("Radical Islam Is the New Nazi," one read) and shouting "Go home!" The annual gathering of Texas Muslims began in 2003. Organizers told the Texas Tribune that this the first year there have been protests.